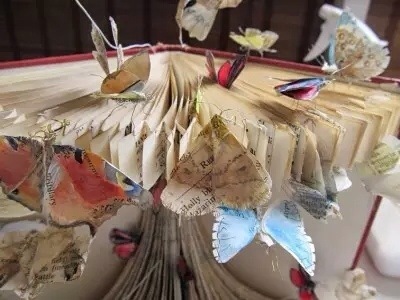 The Mystery Book Artist of Edinburgh has emerged again – this time from a chrysalis in a cloud of butterflies. The work shown will be auctioned for the benefit of Macmillan Cancer. The Macmillan Art Show will be opened this month by the mystery author Alexander McCall Smith: http://macmillanartshow.org/.